As long as you are careful not to either talk too much about your new life in France or criticise your old life in the UK, your friends and family will be excited about your upcoming adventure. You need to remember that they are not coming with you, they are still living in the UK, with all its good points and bad points, so if you say things like you cannot wait to leave, or you don’t like living in the UK anymore, essentially you are criticising them and their life choices. All too often people who have started a new life in France annoy their friends and family back home by saying how they don’t miss anything about the UK, or that their new life is ‘perfect’. Make sure that you don’t fall into this trap and remain conscious of what message you are sending out to people that you leave behind. So, assuming you have been careful about not talking too much about your new adventure and have included your friends and family in your plans, making it clear that they are very welcome to visit you in your new home, they are sure to want to give you a proper send off. If you live near your social network, you can arrange a goodbye party locally. It does not need to be a very formal occasion, or people may feel they have to give you a present. Of course, if they wish to give you a gift then accept it gratefully. You can arrange a French-themed party, with French music, plenty of cheese and wine and perhaps a few flags dotted around. 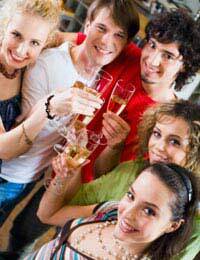 If your friends and family are not located in one area, you could either plan a party in a suitable location for everyone, or suggest people come to your home. Depending on whether or not you want to make a big deal out of your move, you could either hire a village hall or book a restaurant or bar that holds functions. Whatever type of get together you choose to mark the start of your new adventure, try to make sure you involve your friends and family. They will be excited about your move to France, but they will also be concerned about issues you may face, how you will change and how your lives will be different. Say a few words to reassure them and raise a toast. Make sure you say how welcome people will be to visit and that you will look forward to coming back to the UK to see them. If you make an effort to guarantee that your social network can play a part in your new life, rather than you are running away from your old life, they too can look forward to the changes you will be experiencing. If you have children who are leaving behind their friends and boyfriends or girlfriends, remember to keep them involved, too, especially if they are not completely sold on the idea of a move yet. By telling them what to do, you can make that gap wider, but by involving them in the party and the move in general, you may be able to pull together as a family.